WASHINGTON — The Supreme Court gave new life Wednesday to a challenge by African-Americans in Virginia who say lawmakers packed some legislative districts with black voters to make other districts whiter and more Republican. The justices tossed out the part of a lower court ruling that upheld 11 districts in which African-Americans made up at least 55 percent of eligible voters. Justice Anthony Kennedy said in his majority opinion that the three-judge federal court used the wrong legal standard when it determined that race did not play too large a role in creating the 11 districts. The high court upheld one challenged district in which the lower court found that race was an important factor and that lawmakers were justified in considering race. For all the districts at issue, the state argued that the 55 percent threshold was necessary so that minority voters could elect a candidate of their choice, an important consideration under the federal Voting Rights Act. The black voters who sued over the state’s 2011 districting plan argued that it diluted the voting power of African-Americans. Virginia Gov. Terry McAuliffe, who took office after the redistricting and backed the lawsuit, said the decision is a “victory for democracy in Virginia,” according to McAuliffe spokesman Brian Coy. “The governor has long believed that Virginia’s legislative lines are unconstitutionally racially gerrymandered,” Coy said. Marc Elias, the lawyer for the Virginia voters, said the ruling was a big win because it established that states could employ traditional principles of redistricting that include geographically compact districts and still be open to a challenge that they engaged in racial gerrymandering. But the justices did not take up Elias’ request that the Supreme Court strike down the districts. It is now up to the lower court to figure out whether the districts were improperly drawn. 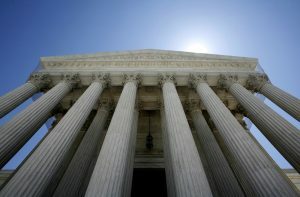 Chief Justice John Roberts and Justices Stephen Breyer, Ruth Bader Ginsburg, Elena Kagan, Anthony Kennedy and Sonia Sotomayor joined Kennedy’s opinion. Roberts’ decision to join the majority was notable because he often is on the other side in cases involving race and electoral district. Justices Samuel Alito and Clarence Thomas, who also are skeptical of the use of race in drawing political districts, agreed with most of the outcome of the case, but differed with their colleagues on the details. The Virginia case was one of two redistricting disputes the court heard in December. The other, involving North Carolina congressional districts, remains undecided. Associated Press writer Alanna Durkin Richer contributed to this report from Richmond, Virginia.